Want to save time and money on skip hire? We have the solution! Away With It provides fast, affordable builders waste removal EC4 businesses and residents can depend on for value and first class customer service. Our builders waste clearance service is perfect for rip-outs and refurbishments. In fact every type of construction, DIY or home improvement project. We can offer a convenient and flexible wait and load service. So you don’t have to worry about skip permits, parking restrictions and access headaches. Plus we do all the heavy lifting. 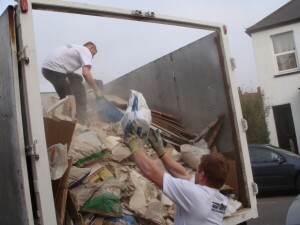 You only pay by the load which means that our on-demand builders waste removal EC4 service usually works out cheaper than skip hire as well as a lot less hassle. All bookings are in two hour slots. And you can rest easy knowing we are fully licensed and insured and your waste will be properly disposed of. To discover just how much time, money and hassle our service will save you give us a call on 0208 504 7390 today. We’ll be glad to discuss your builders waste removal EC4 requirements and recommend the best and most economical solution. Or fill in our online form to get a fast competitive quote.